We sell only premium grade mulch to ensure our customers high quality product. Call us today about delivery and installation of hardwood mulch! 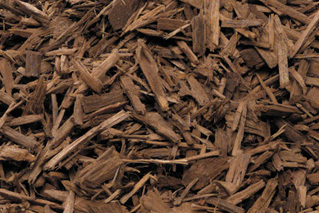 Premium mulch is made from 100% bark and does not contain wood pulp. Because of this it will not become a food source for termites. Our mulch is twice ground premium grade. Twice ground mulch does not need to be spread as thick to retain moisture and help keep weeds at bay. It will give your beds a more consistent and manicured look. Twice ground mulch also breaks down uniformly over the season and will look good for the entire season. When you purchase twice ground mulch versus single ground, you receive more in each cubic yard. This is because with single ground mulch you are purchasing air with each yard as the pieces do not pack as densely. Hardwood Mulch: Premium double ground. This is our best selling mulch and is available in bulk or bag. It is dark brown in color, double ground from the bark of hardwood trees, mainly oak. Sold in bag OR bulk. Call for current pricing. Cypress Mulch: This mulch is double ground. It is a lighter color than the hardwood and is made from Grade A Cypress. Cypress is wood mulch that has been coated with an oil to repel insects and coat any insect eggs to prevent them from hatching. Sold by the bag only. Call for availability and pricing. Cedar Mulch: This mulch is also lighter in color compared to the hardwood mulch. Many customers appreciate the fragrance of this mulch and its insect repelling qualities. Sold by the bag only. Call for availability and pricing. When making the decision to purchase mulch in bags or in bulk it is merely a matter of convenience. 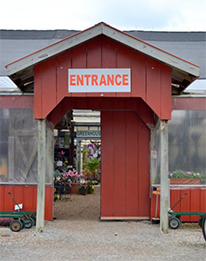 If purchasing a large amount of mulch, the customer may prefer to have a load of mulch delivered to their home and distribute it through use of a wheelbarrow. Another customer may want to spend a little more to purchase bags that can be carried to each area. To determine how much mulch you need the first step is to calculate the area. This will tell you how many square feet you will be covering. Different shaped areas have different equations you must use to calculate. For oddly shaped beds use your best judgment to break the bed up into shapes that can be measured. Then the area of each bed can be determined separately and added together. Remember, if you have more then one area, always calculate the area of the individual beds separate and then add the areas of each bed to find your total. NEVER add all the lengths and widths together and then multiply. You will wind up with a misconstrued calculation. To calculate the area of a rectangle or square, multiply the length times the width. To calculate the area of a circle, measure the diameter and divide by 2. This gives you your radius. Then multiply the radius x radius x 3.14. The second step is to take the calculated area and determine how many cubic yards you will need to cover your bed(s). We sell bulk mulch by the cubic yard or half yard. One cubic yard will cover 100 ft² 2-3 inches. To calculate the number of yards, take the area and divide that by 100. Round up to the nearest .5 (half yard) and you will have the number of cubic yards you need in order to cover your bed. Example: 50 ft² / 100 = 0.5 This bed would need 0.5 cubic yards of mulch. Example: 706.50 ft² / 100 = 7.07 This bed would need 7 cubic yards of mulch. Remember, you can always call us if you need help determining how much mulch you need to cover your area! So . . . How many bags does that mean I need? Example: 2.5 cubic yards x 9 = 22.5 This bed would need 23 bags of mulch. Hint: Slice the mulch bag horizontally at midpoint and lift from corners to empty. Pull all weeds from garden beds prior to installing mulch. Clean out any old leaves or debris as these could promote fungus. Apply roundup to any small weeds that remain. Preen can be applied prior to mulch installation to assist mulch in preventing weed germination. Redefine edges of gardens beds by digging down 2-3” so mulch remains in beds after installation. Apply mulch 2-3” inches deep. Applying mulch in excess of 3 inches can be detrimental to your plantings as air and water will have difficulty reaching them. Do not apply mulch directly to the base of any trees, shrubs, etc. as this will promote rotting. Once mulch is installed, use a plastic leaf rake to smooth out uneven areas. It is NOT RECOMMENDED to put down cloth weed barrier under mulch. This cloth is better suited underneath rock or gravel. If put under mulch, weed seed from the air germinates in the mulch and weeds root into the cloth making weeding extremely difficult. We can deliver up to 10 yards of mulch in our truck. Typically we dump mulch on the driveway per customer instructions. We do our best to accommodate your desired dump spot for the mulch but always leave it to the discretion of the driver. We do not drive into backyards. Delivery pricing varies by location. Call for a quote.